It’s time to “Dress up your Vehicle” with Flexiglass Canopies or Alloy Ute Trays! Come & see the people who sell the market leading Flexiglass Canopies & Alloy Ute Trays. 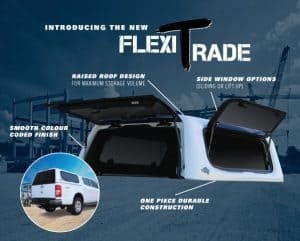 Midland Towbars now supplies & fits the complete range of Flexiglass Canopies. With a huge variety of Trays & Canopies, we’ve got something to get you back to work or out to play. Flexiglass commenced in Western Australia in 1949 when HARRY ROBINS saw the first Holden car and identified the need for a station wagon. Harry created his first canopy using a steam bent timber frame and sheet metal panels. It was an outstanding success and he was soon making a range of designs from aluminium sheeting with side sliding windows. This innovative canopy featured laminated glass and an interior dome light. This was just the beginning for Harry. In 1956 he designed the first ever fibreglass canopy. This canopy was years ahead of its time and featured many similarities to today’s canopies. In 1959 Harry diversified into the fibreglass boat building business and together with his two sons created the foundations of today’s Flexiglass. Today, Flexiglass Challenge Australia is the largest canopy manufacturer in Australia and is an ASX200 listed company. Like what you see? Then come on over to Midland Towbars. We’ll even fit your Flexiglass Canopy or alloy ute tray for you while you wait. For quality products that stand the test of time, give us a call today.